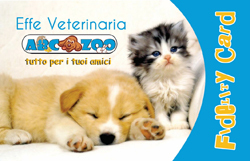 ABC Zoo: when love for our animals becomes a search for all the best for their well-being, from food to cure, hygiene and medications for their health. Visiting our stores is a real walk in the name of love for our best friends, not a tasting but a vast assortment of products for all the needs of dogs and cats and all our little friends. All the top brands and most innovative, even holistic lines, natural and organic.